Our special thanks go out to everyone in the Reading to Kids family. Reading to Kids' success and impact stems from the generosity of our volunteers, teachers, school administrators, funders, donors, and participants. We wish you all a wonderful Thanksgiving! December is one of our biggest months, and the December 13th reading clubs are just over two short weeks away! We can use your help to recruit more volunteers. You can start by joining our December 13th Facebook Event so your friends will see that you will be attending. Then go to our website and sign up with us. Then please tweet, post to Facebook, and email your friends, letting them know that we still need more volunteers. This email template makes it easy. You can also help us by printing out this flyer and posting it at coffee shops, the gym, your office, or favorite community bulletin board. We extend a huge thank you to everyone who has already donated to our 2014 Annual Fund Drive. With December just around the corner, the end of our Annual Fund Drive is in sight, so please contribute if you can. 1) Make a pledge to donate by check or donate online today by visiting our 2014 Annual Fund Drive page. Contributions of any amount are greatly appreciated! 2) Show your support by asking friends and family to contribute! Visit our 2014 Annual Fund Drive page and look under the "Help us Fundraise!" header for resources, including our handy donor sheet for raising money with your friends and co-workers, tips for fundraising, and so much more. This month we are once again fortunate to enjoy the financial support of the Alexander and Ruth Jacobson Foundation and the Charlotte and William Hinson Charitable Foundation. We thank the Alexander and Ruth Jacobson Foundation for their generous $2,000 grant, once again arranged for by dedicated Esperanza volunteer James Ostiller. We also thank the Charlotte and William Hinson Charitable Foundation for their $1,000 donation, and thank volunteer Piper Hinson for directing this donation to us. Working together with Reading to Kids, thousands of Los Angeles children will enjoy the magic and power of reading! Are you starting your holiday gift shopping? Do you shop on Amazon.com? 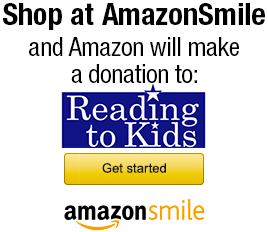 If you shop using AmazonSmile, they will donate 0.5% of your purchases to Reading to Kids! Click here for easy directions on how to start using AmazonSmile to support us!